ProSpirit watches are sold exclusively at Target stores. They come in sleek, sporty designs and are available in almost any color you would want. The best part about these watches is the price, which is usually around $10. 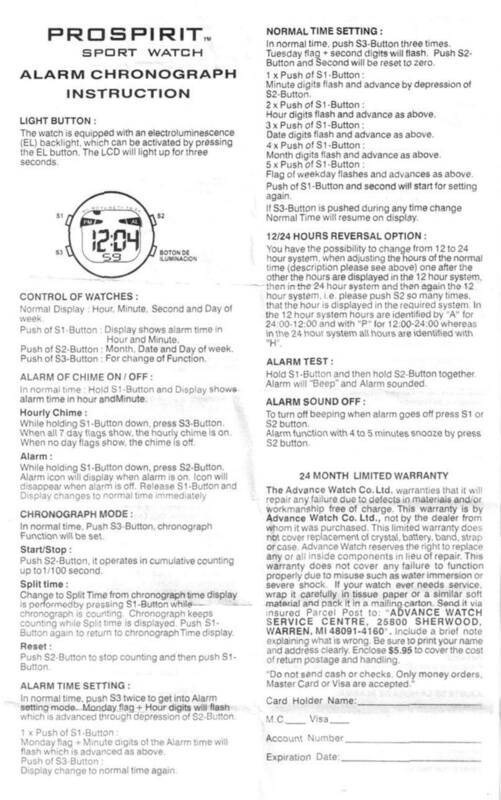 One of the major complaints with these watches is that they either do not come with instructions or that the instructions are simple too small to read. Setting a ProSpirit watch is as easy as pushing a couple of buttons. Locate the button that says Mode. This is typically on the bottom left-hand side when you are looking at the face of the watch. Hold the Mode button until it flashes. The first option is to use the stop watch. Push the Mode button again to set the alarm. Use the two buttons on the right side of the watch to set the alarm. Once you set the hour, push the Mode button again and it will let you set the minutes. Push the Mode button after you set the minutes and then you can set the actual time on the watch. Use the two buttons on the right side of watch to change the time. It uses the same process as setting the alarm, so set the hour first, then press Mode and then set the minutes. After you set the time, press Mode and you will be able to set the date. Press and hold the Mode button for two seconds to finish the setup process.